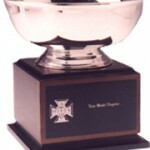 The True Merit Award was first established in 1969 as the Chapter Efficiency Award, becoming the Fraternity’s first official award. In 1975, the name of the award changed to the Chapter Excellence Award and finally in 1979, the name changed to the True Merit Award. 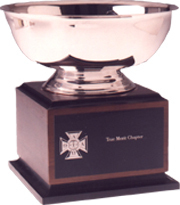 There is no certain number of chapters that will be awarded True Merit from year to year. Rather, in keeping with the spirit of the Creed, the True Merit Award is awarded to as many chapters who achieve a level of chapter operation that is worthy of the recognition. This award annually recognizes chapters achieving an honorable standard in overall chapter operations. Thomas Arkle Clark was head of the University of Illinois Department of Rhetoric in 1895 when he helped organize ATO’s Gamma Zeta chapter and was its first initiate. Seven years later, he was named dean of men, the first in America to have that title. “Unofficially, he won the title of Keeper of the University’s Conscience through his insistence on high ethical and moral standards” records the ATO Story. He did likewise for ATO as Worthy Grand Chief, High Council member, Educational Advisor, and Brother. Brother Clark was nationally known in the early part of the century for his efforts developing the modern Greek system. The Thomas Arkle Clark Award annually recognizes Alpha Tau Omega’s most outstanding senior candidates for undergraduate degrees. It was established as an incentive for young brothers to seek excellence in scholarship, leadership, service, and the personal qualities of character, integrity, and responsibility. This Award is named in honor of founder Ross, whose original gift of $5,000 in 1935 established the ATO Foundation. The Award recognizes chapters who exemplify outstanding charitable giving in their communities and beyond. Established in 1996, the Award recognizes ATO’s top Board of Trustees which provides exceptional leadership and service to a chapter. Established in 2008, this award recognizes chapters or individuals who have been able to withstand and overcome severe chapter operational difficulties.